Chlorogenic acid is a phenolic natural product isolated from the leaves and fruits of dicotyledonous plants, including the coffee bean. Chlorogenic acid is an important factor in plant metabolism. 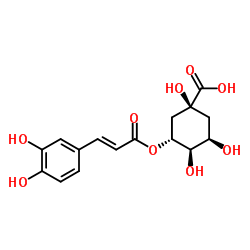 It is also an antioxidant and an inhibitor of the tumor promoting activity of phorbol esters. It has wide anti-virus and anti-bacterial effects. It can be used to differentiate bacteria based on the ability to hydrolyze chlorogenic acid.